Sturdy Literature Racks Efficiently Store And Display Printed Materials. The curved pocket front maintains the literature's integrity and prevents bending. Each pocket holds up to 200 sheets of 8-1/2"x 11" materials. These heavy gauge steel magazine racks expose the top 3" of stored literature. Long life chip-resistant baked enamel finish. Choose Revolving or Wall Mount styles that can be converted to freestanding literature organizers with Optional Legs. Easily store mail, magazines, printouts and more! These literature organizers were designed to save time, space and to compliment any mailroom, information center or reception area. Steel literature racks feature 10"W x 3"H compartments and have an overall size of 34"W x 12"D. Optional 6 H base allows you to use steel models as floor units. Steel models are shipped assembled. Wood models feature solid fiberboard back, durable corrugated fiberboard dividers and self adhesive labels for easy identification. 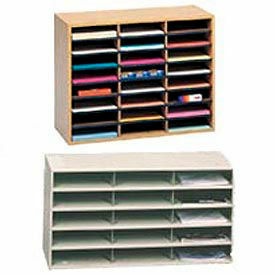 Easy-to-assemble literature organizers feature letter size 9 W x 11-5/8 D x 2-1/2 H compartments. Clear Front Literature Display Racks Provide Easy Access To Materials For Hotels, Waiting Rooms, Travel Agencies, Offices And More. Literature Display Racks are made using clear plastic holders for lasting durability and full viewing of contents. Wall Mount Literature Display Racks come complete with all hardware needed for hanging. Wire partition hangers fit all. Designed for business cards, booklets, pamphlets and magazines. Tabletop Literature Display Racks sit on tabletops or desktops, and feature a tiered build to ensure a minimal amount of table space is used. Rotating Literature Display Racks spin 360° to allow easy viewing of all displayed literature. Available frame colors are Aluminum, Black, Blue, Clear, Gray, Mahogany, Medium Oak, and Silver. Dimensions vary per model. Oak Literature Organizers Provide A Stylish Way To Keep Magazines, Brochures And Pamphlets Handy. 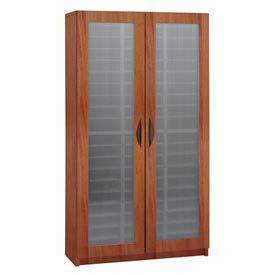 Oak Literature Organizers are constructed with solid oak frames and with laminated panels for long lasting durability. Available in a variety of styles to meet organizing requirements. Neatly displays and organizes printed materials while complimenting any dￃﾩcor. Extra quantities are available. Available in a variety of styles to meet room decor and requirements. Width is Frame colors are Light Oak, Mahogany and Medium Oak. Dimensions and number of openings vary per style. Quantity is 1. Paperwork Organizers store and display documents in protective plastic pockets for easy viewing. Several styles to suit your needs. Desk Stand provides a comfortable viewing angle. Includes 8-1/2" x 11" 5-mil transparent pockets with colored borders. Capacity 30 pockets. Join more units to expand. Wall Unit includes ten 8-1/2" x 11" 5-mil transparent pockets with colored borders. Index tabs included. Capacity 10 documents. Optional Swing Arm Kit available. Join more units to expand. Rotary Display provides 360° document display. Includes base, page holder and fifty 8-1/2" x 11" 5-mil sheets with colored borders. Capacity 50 pockets. 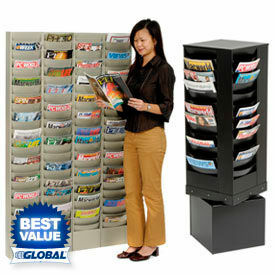 Safco® Onyx™ Mesh Literature Display Racks Are Used For Newsstands, Waiting Rooms, Offices And More. Safco® Onyx™ Mesh Literature Display Racks are made of durable steel construction for long lasting strength and dependability. Steel mesh design allows for easy visibility of contents and easy matching with any d??cor. Wall Mount Magazine Racks are available in 5 and 10 Pocket styles and include all hardware needed for wall mounting. 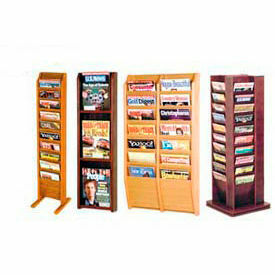 Floor Rack has 3 pockets for attractive uncluttered display of magazines or other reading material. 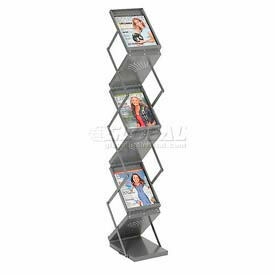 Rotating Magazine Rack is freestanding and rotates 360° for total access to all displayed magazines. Three-side unit has 30 magazine pockets with 1 inch capacity each. 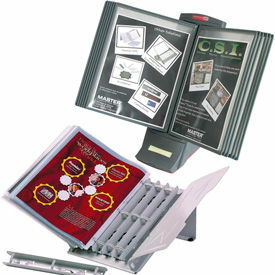 Pamphlet Display sits on tabletop or countertop and has 4 pockets stacked vertically for easy visibility. 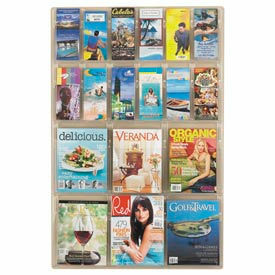 Single Magazine Display is for countertop use and includes removable dividers, allowing display stand to also be used as a pamphlet display. Business Card Display comes with 8 pockets for ample room to keep a variety of business cards visible and easily accessible. Literature Cabinets Offer An Intelligent Design With A Modern Appearance. Translucent panel doors protect literature from dust. Doors feature positive closure hinges to keep doors closed and door pull handles. Includes height adjustable shelves. Measures 30"W x 14"D. Available in Cherry, Mahogany or Medium Oak finish. Easy assembly. 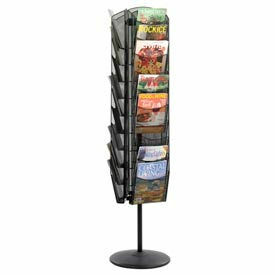 Lightweight, portable magazine racks display 8-1/2 x11 materials and easily set up and fold in seconds. These literature racks feature a sleek contemporary style and an attractive textured metallic gray powder coat finish that is used for trade shows. The heavy gauge steel construction ensures long life. Choose single sided display with 4 pockets that folds to 8 H or the double sided display with 6 pockets that folds to 7-1/2 H. These literature organizers include carrying case. Mobile Carts Fit Under Most Work Surfaces For Storage And Easily Move Where You Need Them. Carts are made of compressed wood with laminate finish. Includes adjustable pull-out letter-size shelves for storing flat materials. Shelves have finger cut outs for easy removal. Moves easily on hooded swivel casters (2 locking). 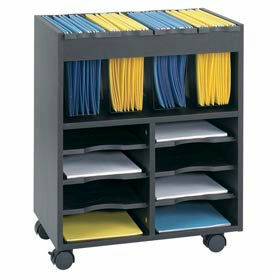 8-Compartment Cart includes 6 pull-out shelves and 4 removable plastic tubs for hanging files. Plastic tubs offer 5" of space for letter-size hanging files. 14-Compartment includes 12 pull-out shelves. Easy assembly. 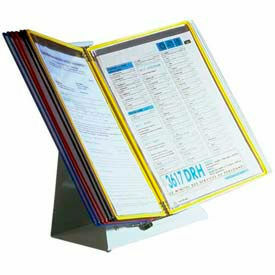 Martin Yale® Paperwork Organizers Allow Documents To Be Displayed While Preventing Wear And Tear On Pages. Martin Yale® Paperwork Organizers are available in several styles, functions and sizes to suit display needs for catalogs, information guides, maps and more. Options include Hinged Racks, Desktop Stands, Wall Mount Sets, Ring Sets and Reference Sleeves.